Chasing Distractions: Futurama No More? From some articles I just finished reading there does not appear to be any more DVD’s in the making, nor does it look like they will be coming back for a 6th season, but I guess that will all depend upon the DVD sales. Overall it has been a good run, I have thoroughly enjoyed the show, which has been on and off again since the first airing in 1999. 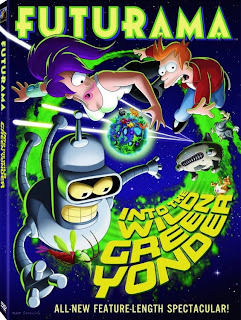 This last instalment, Into the Wild Green Yonder, does not disappoint and stays in the typical Futurama style. So if you like the show, support them and go out and buy the DVD. Who knows, your one ‘vote’ may just matter. Isn't though? I'm sure the fans will rise up and they will end up making a feature length movie.